Nike aren’t afraid of utilising non-traditional methods to help aid the progression of running footwear, but there’s been little to no coverage of Nike’s renowned ‘innovation kitchen’. The name makes you feel like it’s some kind of magical laboratory where the Nike technicians are all decked out in white coats, safety goggles and huddled around scientific equipment. If this interview with Nike shoe designer Mike Friton is anything to go by, then it’s quite the opposite. 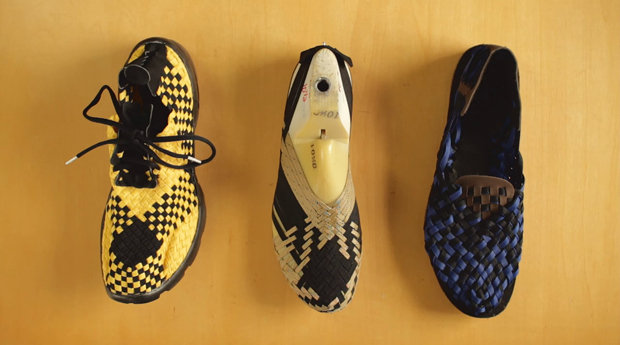 Mike Friton is a freelance weaver, sculptor, shoemaker and has 30 years of experience working for Nike. He’s responsible for most of Nike’s innovative running shoes. This fascinating video explores Friton’s working processes and provides an insight in to some of the techniques that he uses, all filmed beautifully. It’s a pleasure to see such a great interview available to footwear fanatics, and hopefully we will be able to see more documentation on the designers behind some of our favourite shoes in the near the future. If, like us here TDS, you are enthusiastic about the creative process and design behind the shoes on your feet then this is a must watch.